The Delta estuary is the largest estuary on the West Coast. Covering more than 738,000 acres in five counties, it is a maze of tributaries, sloughs, and islands and a haven for plants and wildlife, supporting more than 750 plant and animal species, including more than 110 species listed as “species of concern.” The Delta is critical to California's economy, supplying drinking water for two-thirds of Californians and irrigation water for more than 7 million acres of the most highly productive agricultural land in the world. 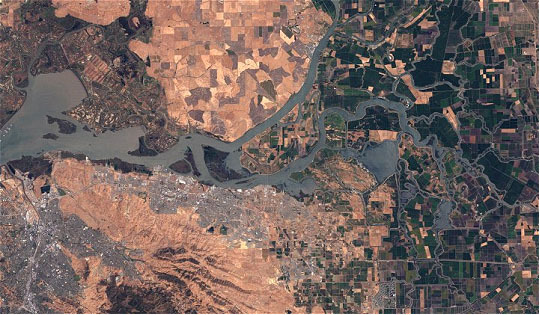 The Delta is also the hub of California’s two largest water distribution systems – the Central Valley Project (CVP) operated by the U.S. Bureau of Reclamation (Reclamation) and the State Water Project (SWP) operated by the California Department of Water Resources (DWR). Maintaining high quality water in the Delta is critical for drinking water supplies, agricultural irrigation, and ecosystem function. More than 1,100 miles of levees protect the water conveyance functions, ecosystem, and land uses on Delta islands. The Sacramento and San Joaquin River channels also provide important shipping access to the Ports of Sacramento and Stockton. In recent years, conflicts about levee rehabilitation, dredging, and placement of dredged sediments have been increasing. There is an ongoing need to dredge Delta channels for navigation, water conveyance, flood control, and levee maintenance. At the same time, there are increasing regulatory concerns about the potential impacts to water quality and the ecosystem from levee work, dredging activities, and dredge materials placement and reuse. In the last several years, agencies, the public, political leaders, and the media have become increasingly concerned about the urgent need for levee rehabilitation in the Delta. One possible contributor to Delta levee rehabilitation is sediment management and reuse from dredging activities. At the same time, the Delta environment is showing signs of major stress and dysfunction, as evidenced by the rapid decline of pelagic species in recent years. Concerns about the complex and sensitive environment in the Delta have resulted in stringent regulatory requirements for dredging and sediment reuse and placement in the Delta. These two apparently conflicting objectives, protection of the Delta environment and increased dredging and sediment reuse and placement, highlight the need for better coordination and management of Delta dredging and sediment management and reuse requirements. In late 2004, local sponsors of Delta dredging projects and the U.S. Army Corps of Engineers (USACE) met to explore the feasibility of developing a long-term management strategy (LTMS) for dredging and dredged materials placement or reuse in the Delta. A similar process was used to successfully develop a collaborative, coordinated approach to dredging and sediment management in San Francisco Bay.